Paul Klee is born on December 18 in Münchenbuchsee, a suburb of Bern, Switzerland. Second child of Hans Klee (1849-1940), a German music teacher, and his Swiss wife Ida Marie Klee (née Frick, 1855-1921). Shows early gift for music and an interest in drawing. Regular schooling, graduates in 1898 from the Literaturschule Bern, where he develops an interest in Ancient Greek and French literature. Parallel to his formal education, takes violin lessons from Karl Jahn, a former pupil of the celebrated violinist Joseph Joachim. His talent and skill secure him a place in the orchestra of the Bernese Music Society. He is undecided for a long time between music and visual art, but he finally chooses art and moves to Munich in October 1898. Enters the private drawing school of the academic painter Heinrich Knirr in preparation for the Academy. Attends concerts and operas frequently. At a musical soirée in December 1899, he meets his future wife, the pianist Lily Stumpf (1876-1946). In autumn 1900, he enrolls in the class of Franz von Stuck at the Academy. Although Vasily Kandinsky is a fellow student, they do not become acquainted. Concludes his studies in Munich and becomes engaged secretly to Lily Stumpf before returning to Bern at the end of June. In October he starts a six-month tour of Italy with the sculptor Hermann Haller, a childhood friend. They visit Milan, Genoa, Pisa, Rome, Naples, and Florence. Overwhelmed by the art of the Renaissance and Antiquity, he is haunted by the fear of living in an epigonic age and sees his future in 'caricatures.' In May 1902, returns to Bern where he is to remain until 1906. Period of relative seclusion devoted to his 'self-education'. Regular visits to and from Lily Stumpf who lives in Munich. He is employed by the Bernese Music Society for two concert seasons as a violinist. From October 1903 until March 1906 he reviews opera and concerts for the Berner Fremdenblatt & Verkehrszeitung, published by his friend Hans Bloesch. Begins the series of etchings called Inventions (completed in 1905), which he describes as Opus One, his 'critique of the bourgeoisie'. During a ten-day visit to Munich in October, Klee studies the works of Goya, William Blake, and Aubrey Beardsley in the Kupferstichkabinett. At the beginning of June, first visit to Paris, accompanied by Hans Bloesch and the painter Louis Moilliet. Spends many hours in the Louvre and the Musée du Luxembourg; however, there is no mention of contemporary French painting in his diary. In April, travels to Berlin to see the centennial exhibition of German art (1775 to 1885). Ten etchings from his Inventions series are shown in the Munich Secession exhibition. In September, he marries Lily Stumpf in Bern and moves to Munich. After the birth of their only child, Felix, he takes care of the household while Lily earns money by giving piano lessons. The summers are usually spent in Bern. In spring 1908, Klee sees the exhibitions of Van Gogh in two private galleries in Munich. The following year he encounters the work of Cézanne who is represented by eight paintings in the Munich Secession exhibition. In August 1910, Klee's first solo exhibition, of more than fifty works from the period 1907-1910, opens at the Kunstmuseum Bern. 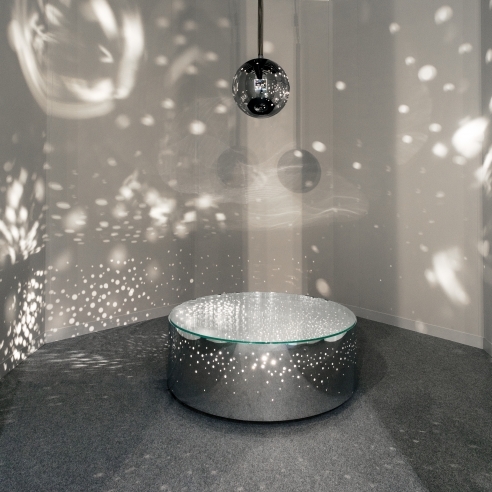 The exhibition travels to Zurich, Winterthur and the Kunsthalle Basel. Klee makes contact with the contemporary art scene. In February 1911, he begins a work catalogue of his past and current paintings, including some that date back to 1893. In January, Alfred Kubin pays a visit to Klee in Bern marking the beginning of a life-long friendship. Klee starts work on a series of illustrations for Voltaire's Candide. Through his friend, Louis Moilliet, he meets the painter August Macke and makes the acquaintance of Kandinsky. Contributes reviews of art exhibitions and opera performances to the Swiss monthly magazine Die Alpen (until December 1912). 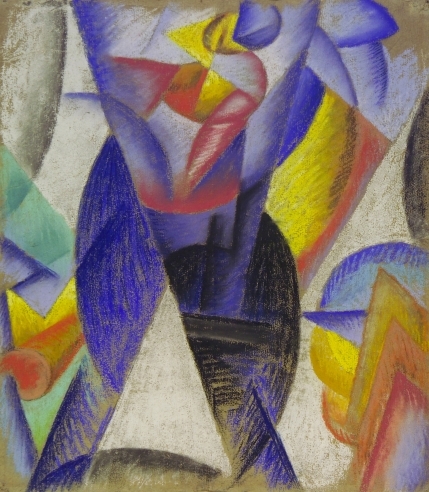 Klee joins the Blauer Reiter group founded by Kandinsky and Franz Marc, and exhibits seventeen of his works in their second exhibition in Munich. At the beginning of April, he spends two weeks in Paris. He visits Robert Delaunay in his studio, and encounters the work of Picasso, Braque, Derain, de Vlaminck, and Matisse. Enters into a close friendship with Marc, who introduces him to Herwarth Walden, the founder of the magazine and gallery 'Der Sturm' in Berlin. 'Über das Licht,' Klee's free translation of Delaunay's essay 'La Lumière,' 1912 appears in the January issue of Der Sturm. Herwarth Walden shows Klee's work in Berlin. In April, he embarks with Macke and Moilliet on a journey to Tunisia that has a decisive effect on his artistic self-confidence: "Colour and I are one, I am a painter." Exhibits eight of the Tunisian watercolours in the first exhibition of the New Munich Secession, of which he is a founding member, acting as its secretary from 1918 to 1920. The outbreak of the First World War on August 1, 1914 finds Klee in Bern. The Blaue Reiter group is dispersed. Kandinsky, Gabriele Münter, Marianne von Werefkin, and Alexej von Jawlensky all leave Germany. Macke dies in the first weeks of the war, Marc in March 1916, only a few days before Klee is drafted. He does not have to serve in action, but is assigned to tasks behind the front. The intellectual confusion surrounding the war leads Klee to a more distant view of the Romantic heritage: 'Cool Romanticism.' Draws and paints during his spare time. In November 1918, he finishes an essay that appears in 1920 in an anthology of artists' writings titled 'Schöpferische Konfession' (the so-called 'Creative Credo'). In the aftermath of the November 18 Revolution, Klee joins radical organizations of artists and becomes a member of the commissariat for painting in Bavaria's short-lived 'Soviet Republic' (Räterepublik), proclaimed in April 1919. When this regime is ousted through military intervention at the beginning of May, Klee flees to Switzerland. In November, the Stuttgart Academy of Art rejects the proposal of the Student's Council, represented by Oskar Schlemmer, to appoint Klee as a professor. Klee's Munich dealer, Hans Goltz, shows a large retrospective exhibition with 362 of his works. In autumn, the first monograph on Klee, written by Leopold von Zahn, appears. On October 29, he receives a telegram from Walter Gropius offering him a position at the Bauhaus, the new State School of Art and Design in Weimar. Klee starts teaching at the Bauhaus in January 1921. Among his colleagues, besides Gropius, are Feininger, Schlemmer, Itten, Muche, Adolf Meyer, and Marcks; Kandinsky joins the staff the following year. His assignments over the years are very varied, covering all areas of the arts and crafts: 'form master' (artistic advisor) in the bookbinding and stained-glass workshops, basic instruction, courses on textile composition and theory of form as well as painting and sculpture classes. When the Bauhaus, owing to political pressure, moves from Weimar to Dessau in 1925, Klee follows and, from 1926 onwards, the Klees share with the Kandinskys one of the new houses for the professors built by Gropius. The summers are often spent travelling abroad, particularly in Italy and France. With the beginning of the winter semester, Klee starts a series of lectures titled 'Contributions to the theory of plastic forms' (Beiträge zu bildnerischen Formenlehre), published in 1979 by the Paul Klee Foundation, Bern. Klee's essay, 'Ways of Nature Study' (Wege des Naturstudiums), appears in the publication accompanying the summer exhibition, "Staatliches Bauhaus – Weimar 1919-23." In October he exhibits at the Nationalgalerie im Kronprinzenpalais, Berlin. First solo exhibition in the United States at the Société Anonyme, New York. On the occasion of his exhibition at the Kunstverein in Jena, Klee delivers the famous lecture which is published posthumously in 1945 as 'On Modern Art' (Über die moderne Kunst). Klee's Pedagogical Sketchbook (Pädagogisches Skizzenbuch) appears as volume 2 in the series of Bauhaus books edited by Gropius and Moholy-Nagy. First solo exhibition in France at the Galerie Vavin-Raspail, Paris. Participates with two works in the first group exhibition of the Surrealists at the Galerie Pierre, Paris. In March, Gropius, Bayer, Breuer, and Moholy-Nagy leave the Bauhaus. Under the new directorship of Hannes Meyer, the curriculum becomes more strictly regulated and orientated towards architecture. Klee's essay 'Exact Investigatinos in the Realm of Art' (Exakte Versuche im Bereich der bildenden Kunst), which appears in the 3 February issue of the Bauhaus magazine, can be seen as a reaction to this change of policy. In the winter 1928, Klee makes a journey to Egypt that inspires an important group of works, such as Main Way and Byways (Hauptweg und Nebenwege), 1929. First discussions about a teaching post at the Düsseldorf Academy. Klee's fiftieth birthday is celebrated by exhibitions in Dresden, Paris, and Berlin. Will Grohmann's first monograph on Klee is published by Cahiers d'Art in Paris. 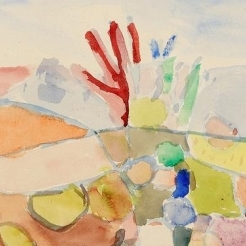 Klee's main dealer since 1928, Alfred Flechtheim, organizes a large solo exhibition in his Berlin gallery, which is subsequently shown at The Museum of Modern, Art, New York. Klee informs the Bauhaus of his intention to leave at the end of the winter semester. In October 1931, joins the faculty of the Düsseldorf Academy as professor of painting. Meanwhile, the organized actions of the Nazis against modern art have begun. The Bauhaus in Dessau is closed in autumn 1932; its re-opening in Berlin lasts only until April the following year. In March 1933, Klee's house in Dessau is searched during his absence. 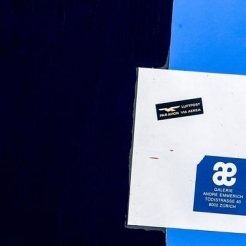 On 6 April, Klee is removed from the list of teachers: 'Prof. Klee as Jew [sic] and teacher impossible and dispensable' and is dismissed two weeks later. At the end of December he leaves with his family for Switzerland. Klee's last years in Bern. 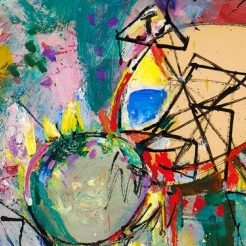 Despite the loyality of a few collectors and contracts with Kahnweiler in Paris (1933) and Nierendorf in New York (1938), this is a difficult period. In addition to the deteriorating political situation, Klee's life is upset by a severe illness. He contracts measles and subsequently develops symptoms that are diagnosed in 1936 as scleroderma, an incurable disease. First exhibition in England at the Mayor Gallery, London. Kahnweiler shows Klee's work in his gallery in Paris that is now called Galerie Simon. Will Grohmann's book on Klee's drawings of the years 1921-30 appears and during its distribution in Germany, is confiscated by the Nazis. Exhibitions in Bern, Basel and Luzern. Klee's own catalogue of his oeuvre registers only twenty-five works for this year. On the occasion of an exhibition in Bern, Kandinsky visits Klee. Seventeen works of Klee are included in the exhibition "Degenerate Art" (Entartete Kunst) in Munich, and over one hundred are confiscated from public collections in Germany. In November Picasso visits Klee in Bern. Klee, by birth a German citizen, applies a second time for Swiss citizenship, having been rejected earlier on formal grounds. He produces 1253 works, most of them drawings. The Kunsthaus Zurich opens an exhibition of works made between 1933 and 1940 in honour of Klee's sixtieth birthday the year before. On June 29, 1940, Paul Klee dies in the hospital Sant'Agnese in Muralto-Locarno.